What are the functions of the Division of Drinking Water? The Division of Drinking Water (DDW) acts as the administrative arm of the Utah Drinking Water Board. It implements the rules which they adopt. As such, it is engaged in a variety of activities related to the design and operation of Utah’s public drinking water systems. For a listing of the activities the Division is involved with as well as the activities that are performed by others, see Do’s and Don’ts of DDW. What is a public drinking water system? A public drinking water system is legally defined as any drinking water system (publicly or privately owned) which serves 15 or more connections, or 25 or more people at least 60 days out of the year. What is the Utah Drinking Water Board? The Utah Drinking Water Board (DWB) is an 11 person board appointed by the Governor. 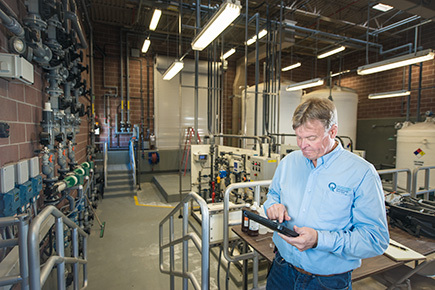 It is empowered by Title 19, Chapter 4 of the Utah Code to adopt rules governing the design, operation, and maintenance of Utah’s public drinking water systems. The Board meets monthly and the public is invited to attend. See Utah Drinking Water Board for more information. Does the federal government or EPA regulate Utah’s public drinking water systems? There is a Federal Safe Drinking Water Act which applies to all public drinking water systems in the country. The U.S. Environmental Protection Agency (EPA) has given Utah primacy for enforcing the federal act within its boundaries. (Primacy means primary enforcement responsibility.) To qualify for this primacy, Utah’s laws and rules governing public drinking water systems must be at least as strict as the federal law. See also the EPA’s Office of Groundwater and Drinking Water. Why can’t I find information about well or spring locations on your site? DDW considers this information sensitive, so it is not available over the Internet. You can obtain information on sources and source protection zones through a formal Government Records and Management Act (GRAMA) request to our office. General information on historical records of water rights and points of diversion in the state can be obtained from the Division of Water Rights (801) 538-7240. What if my water comes from a private well or a non-public system? The rules of the Utah Drinking Water Board do not pertain to systems serving fewer than 15 connections or 25 people. However, some local health departments do have rules pertaining to private water suppliers. For information on contacting local health departments, see the Directory of Local Health Departments. See also Do You Have Your Own Private Water Supply? Are there other Utah state agencies that deal with drinking water? Yes. There are other State agencies which deal with drinking water supplies. However, they deal with different aspects. The Utah Division of Water Rights deals with water rights issues and the issuance of well drilling permits. The Utah Division of Water Resources provides funding for a variety of municipal and agricultural water projects. The Utah Division of Drinking Water deals primarily with issues regarding public health protection. For further information, see the Listing of Other Utah State Water Agencies. Who regulates bottled water or home water treatment devices? Rules regarding bottled water are administered by the Utah State Department of Agriculture and Food. There are currently no State rules regarding the safety or effectiveness of home water treatment devices. However, the popular press does occasionally review these devices. The National Sanitation Foundation is an independent standard-setting organization. This organization has established standards for bottled water and home water filters. Many manufacturers produce their products in accordance with their standards.